So, I realize my last post was about me being sick and then I kinda just dropped off the map for a few weeks, but I’m here to tell you that I am alive and well! I actually started feeling 100% again just a few days after my post about being sick, but I haven’t been online much partly because I’ve been pretty busy (but in a good way) and partly because I haven’t been able to connect to my neighbor’s wifi like I was before (and I am not going to go to them and ask them what the deal is, as they’ve graciously allowed me to steal their wifi for over a month now, with no cost to me). I did get a modem (for free, from one of the PCVs who recently left), but unfortunately it happens to be for the service provider with the slowest internet connection in town, but at least I can still get online. 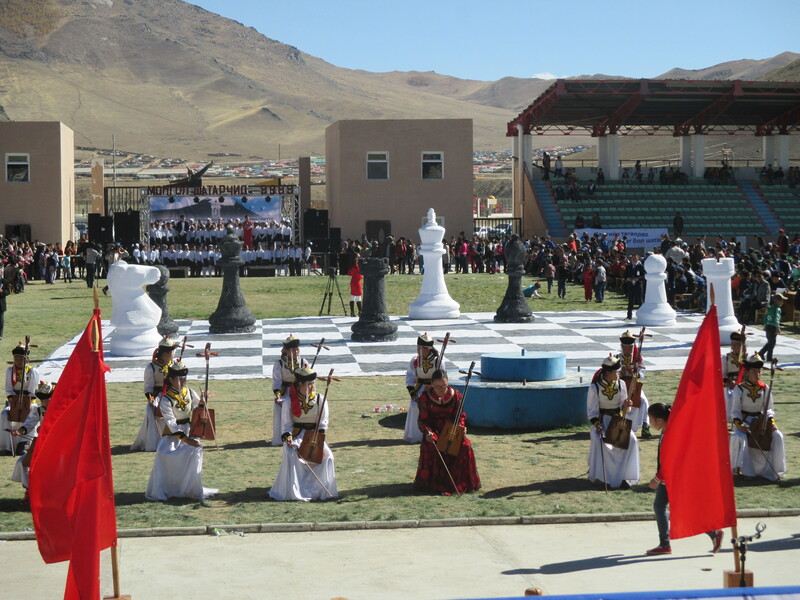 There was a huge, aimag-wide chess competition going on for several days. And I mean huge! 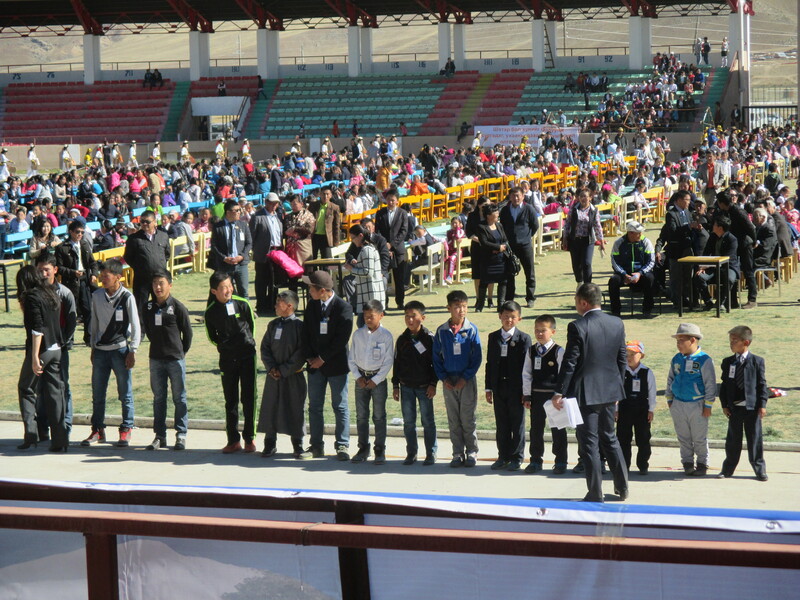 There were a total of 9999 students taking place in the competition (so, basically all the students in the aimag), school was cancelled for days, students from all the different soums throughout Zavkhan came into Uliastai for the final rounds of competition, and there was a fancy “closing ceremony” in the brand new stadium here in town. Turns out, he’s kind of a big deal. Along with being the president of the World Chess Federation since 1995, he was the President of the Republic of Kalmykia in Russia from 1993 to 2010 and is a multi-millionaire. 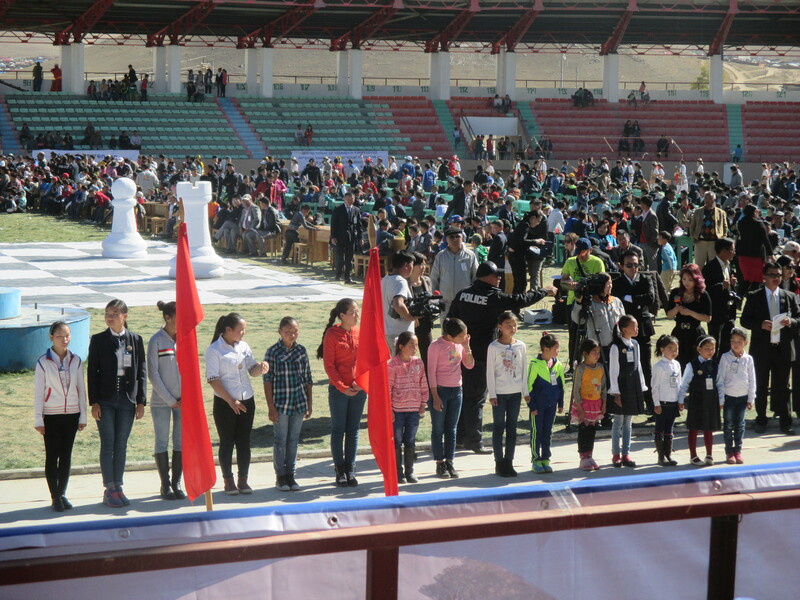 So while the whole enormous chess competition thing was pretty amazing by itself, having an important international politician and businessman show up ensured that reporters from all the national news stations in Mongolia were there, which is how I ended up being on Mongolian TV (in the background of course–we just happened to be sitting right behind where the important guy was giving his speech). 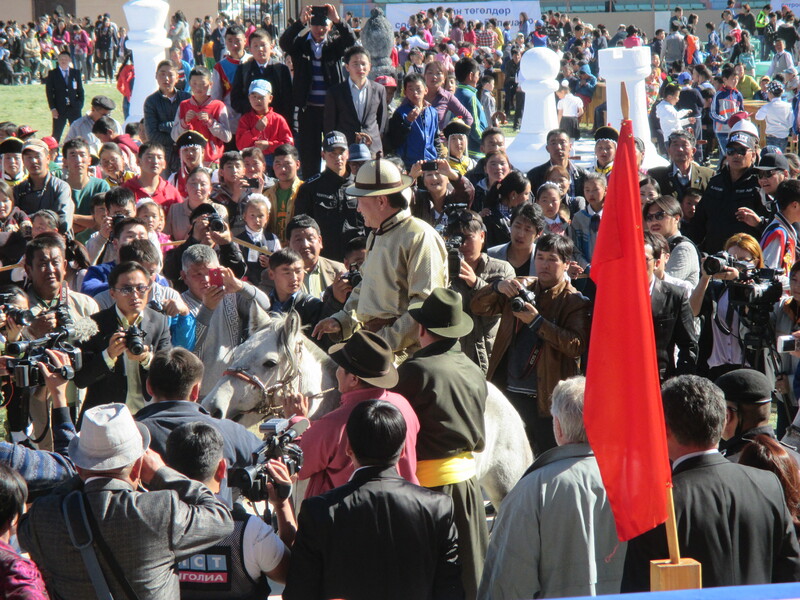 Oh, and they gave him a horse as a gift, because that’s something that happens in Mongolia. I went to a concert with some of my coworkers from the health department. 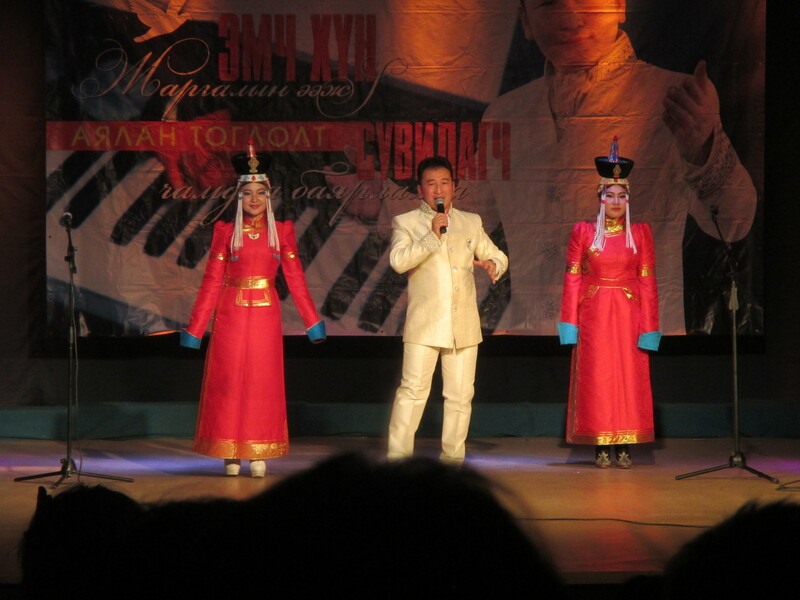 The headliner was a relatively famous Mongolian singer, B. Khangal, who also happens to be a doctor, because why the hell not? 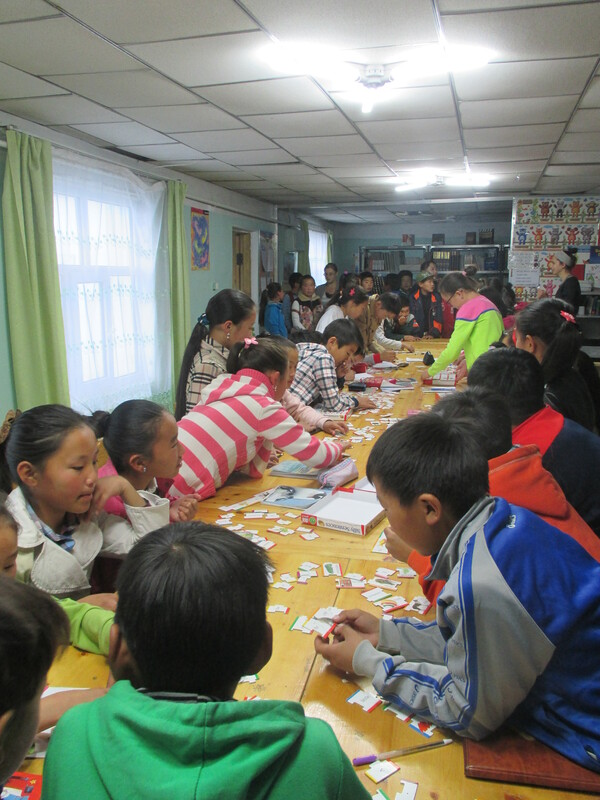 I started helping out a couple of the TEFL PCVs here in Uliastai with their English classes for students that take place every Saturday at the local library, which is funded in part by Bookbridge. We have one-hour classes for 3 different age groups (including lots and lots of games), and given the current surge in the number of students coming each week, we may need to create an additional class or two to accommodate all the students. I had my first site visit by my Peace Corps Regional Manager. Twice a year, PC staff travel all around the country to visit each and every one of us PCVs to make sure everything is going well with our living conditions and at our HCAs. So the Regional Manager for our good ‘ol Western region came out here to visit each of our homes (note: my ger is still awesome, she informed me) and to sit down and chat with our coworkers at our HCA. Not much else to say about that, since the whole 50-hour work week issue had been resolved already and the people at the health department didn’t appear to be begging her to send a different PCV to replace me, so it was pretty uneventful, but a nice visit nonetheless. A couple of our Mongolian friends also brought a bottle of wine, because we’re classy (and they know I don’t like beer or vodka, which are the only other drinks available here). There was a huge group of kindergarten teachers at the tables next to us, and they, on the other hand, were enjoying a couple (or twelve) bottles of vodka. The restaurant we were at also plays music later in the evening, and these teachers started going on to the dance floor and dancing the standard awkward Mongolian circle dance (imagine a bunch of preteens at a middle school dance, and you’ve pretty much got the idea). And then they started coming over to our table and literally dragging us onto the dance floor. 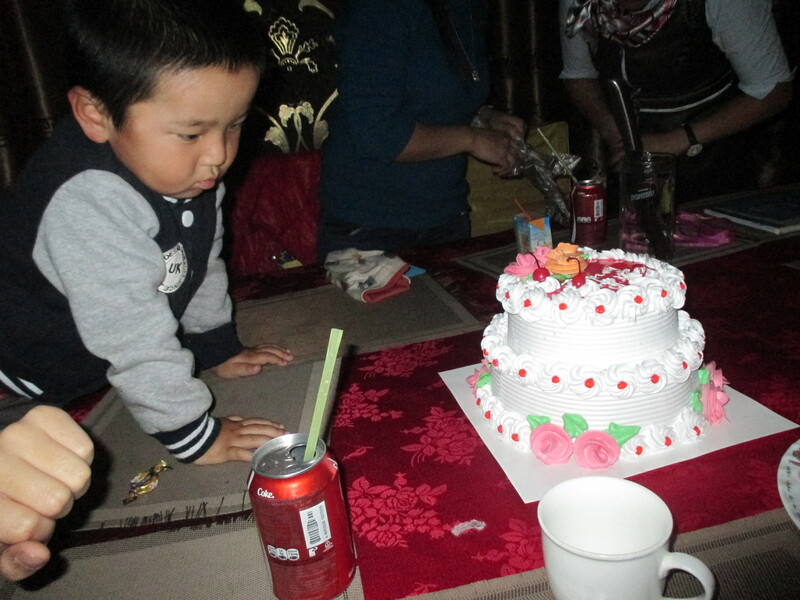 Eventually we managed to escape, but it was a quite memorable first birthday in Mongolia. On Sunday, my site mates and I hung out at one girl’s apartment, eating food (including another cake! ), drinking more wine, and playing games. Overall, a very good birthday weekend! You know what’s never fun? Being sick. You know what’s even less fun? Being sick in a foreign country, in a new city, far far away from family and friends, without running water or a toilet, and with my doctor and all the potentially helpful medicines he could prescribe on the other side of the country. In case I haven’t mentioned before (I have), I’ve had a cold for over 4 weeks now. I started having some mild symptoms right before coming out to Uliastai, but with the immediate start to work, adjustment to living in a completely new setting, and insane busy-ness in general, my immune system has not been able to fight it off. I already told you about my maybe-not-so-wise decision to go hiking with my coworkers, after which my symptoms got much worse. The following week at work, I had to go home early after lunch on both Monday and Tuesday because I felt so bad and everyone could tell. In addition to the cold symptoms, I also had really bad stomach cramps. When I went home on Tuesday I laid down for a really long nap, and then that evening my supervisor came to check on me and bring me something for dinner. By then my stomach cramps were so bad I could barely move, and being in any position other than laying down felt horrible (not that lying down didn’t hurt too). My supervisor freaked out and told me to call the PCMO, which I did. The Peace Corps doctor told me I was probably just really dehydrated, which was what was causing the cramps. So he told me to drink a bunch of warm water, but slowly, and then take some medicine. 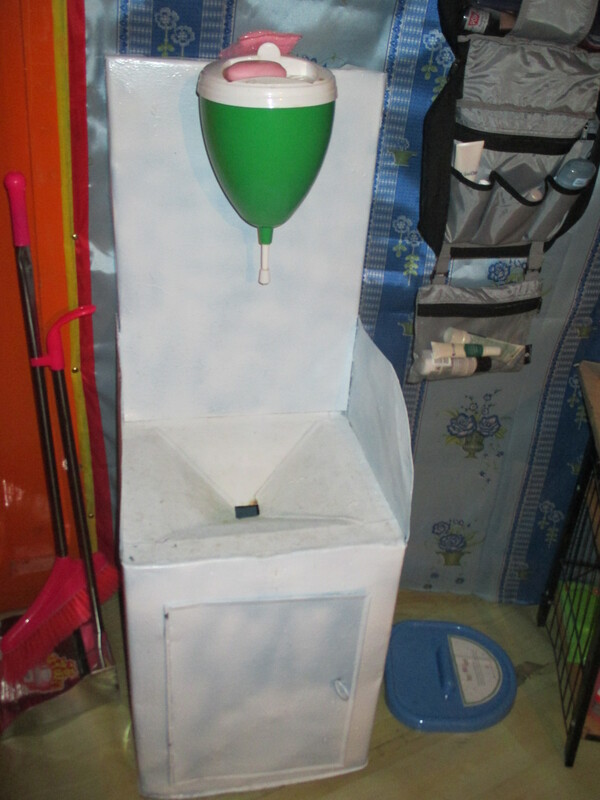 …which just drains into a bucket underneath that I have to empty every few days. So, basically just vomiting into a bucket. By this point my supervisor still hadn’t abandoned me in my diseased state, but proceeded to cook up what she called “rice juice,” which she said is what Mongolians drink/eat to coat their digestive system and ease cramps. I tried to drink some more water while it was cooking, and when it was done I had two bites before throwing up again. I called the PCMO again to tell him I had thrown up twice in the past 30 minutes, making it kind of hard to get hydrated, and he told me to stop trying to ingest anything and just go to bed. So my supervisor reluctantly left to let me sleep. I had the rest of the week off from work while I tried to rest up and finally get better. My supervisor was insanely helpful, bringing me lunch and dinner all three days I missed work. The thing about working with a bunch of doctors, nurses, pharmacists, and other health professionals is that they know how to take care of you when you’re sick. My supervisor is a pharmacist, so she was checking over all the medications I was taking. The director of the health department is a doctor (specifically a surgeon), and he even came over to my ger the day after my stomach cramp/vomiting ordeal to check on me (and joke about maybe needing to do an emergency surgery). Thankfully my stomach problems went away the very next day, but my cold symptoms are still with me, even a week later (it’s been almost 5 weeks now total). I’ve been taking plenty of medicine, and the PCMO even sent me some additional medicine from UB, but nothing provides more than temporary relief for my symptoms. A few people have suggested that maybe it’s just due to the seasons changing and the weird weather patterns (constantly alternating freezing temperatures with rather balmy ones). Whatever it is, I hope it resolves soon, because winter will not be fun if I’m already sick. I told you there would be lots of hiking! 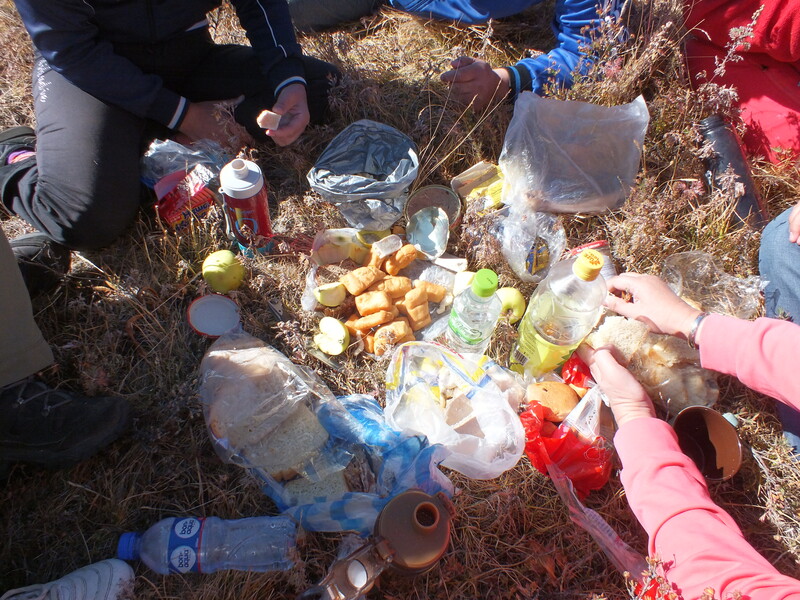 The Saturday after my third week in Uliastai, a group of coworkers from the health department and I went hiking. 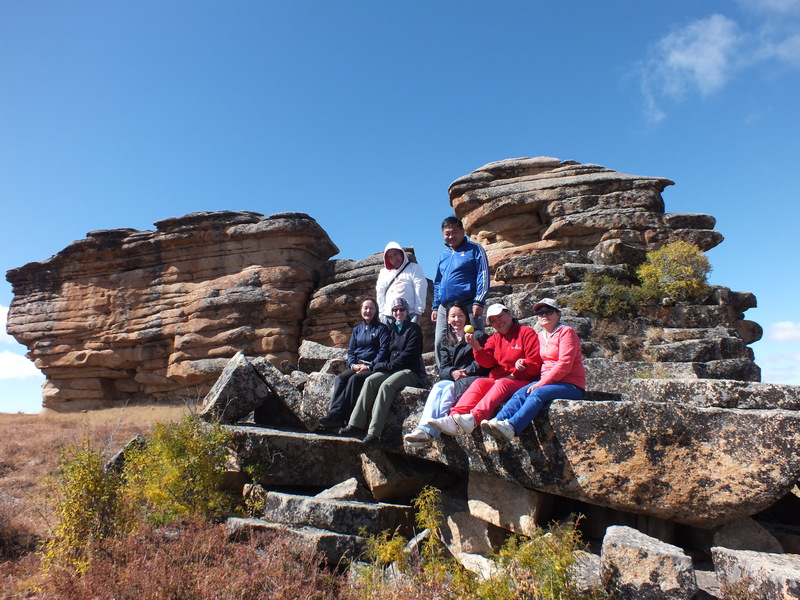 They had invited me earlier in the week, before I was completely exhausted, so I had agreed to go, only to be sore from tons of aerobics and tired from lack of sleep the morning of the hike. 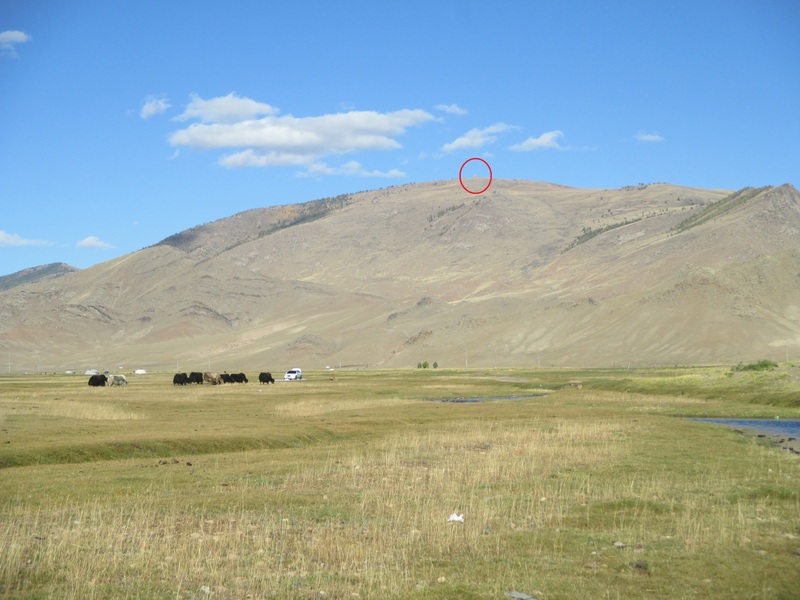 …which is apparently the tallest of the mountains surrounding Uliastai. 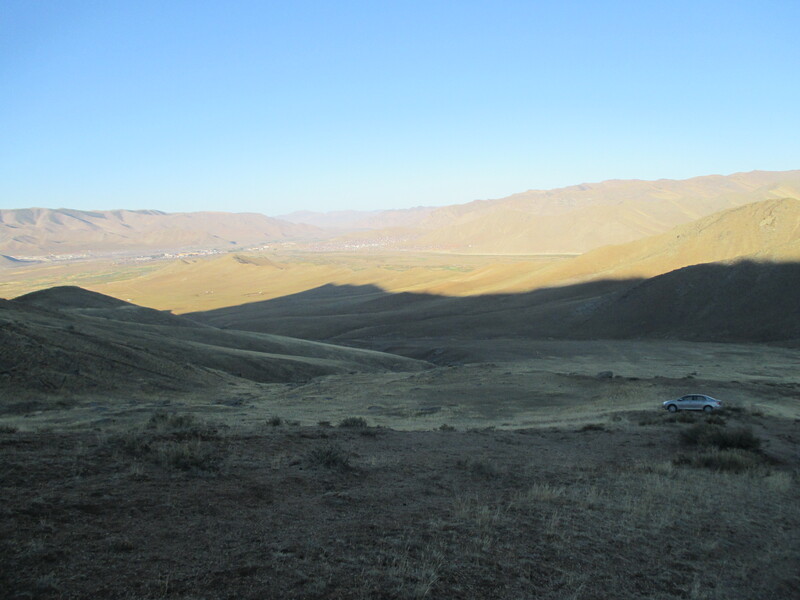 But when we started driving in a different direction, straight through the valley (and all its rivers and streams, at one time getting stuck, because off-roading in a sedan is not the brightest of ideas), I assumed that the plans had changed. 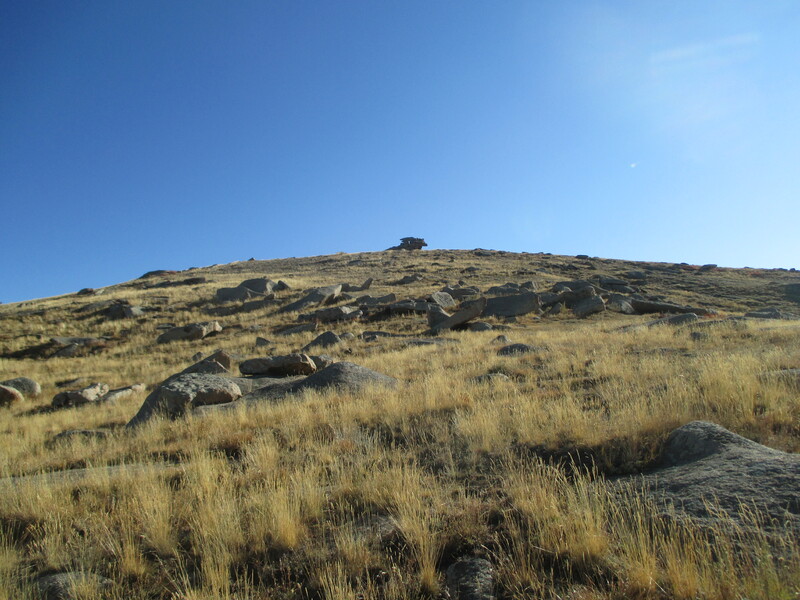 We abandoned the car and finally started up the mountain, which wasn’t too steep at first, until it suddenly was. It was also very cold, as the sun was rising on the other side of the mountain. Which was great for my never-ending cold (as in, the upper respiratory infection). Let’s just say my pockets were stuffed full of tissues for my dripping nose the whole time. 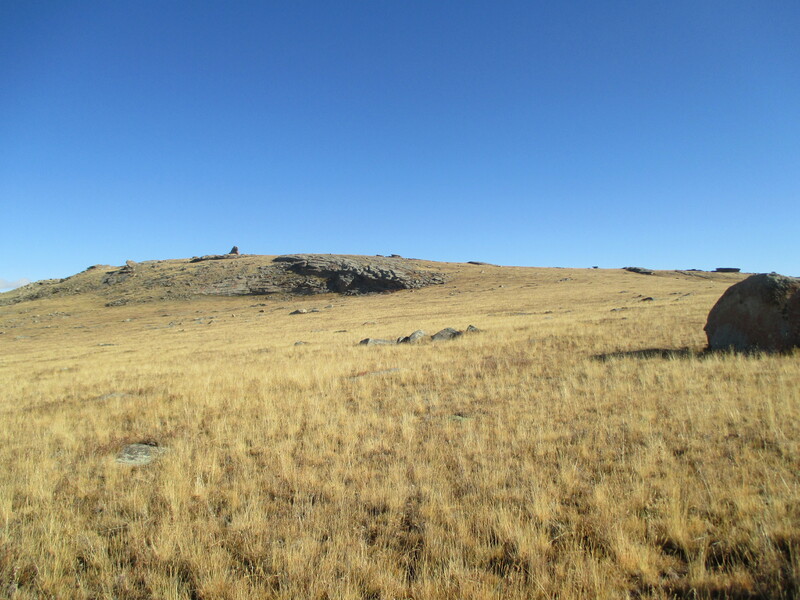 After a while, we came to what I thought was the top of the hill we were climbing, but ended up just being a slightly less steep part of the hill. At least it was pretty with all the trees, and we were finally up in the sun. 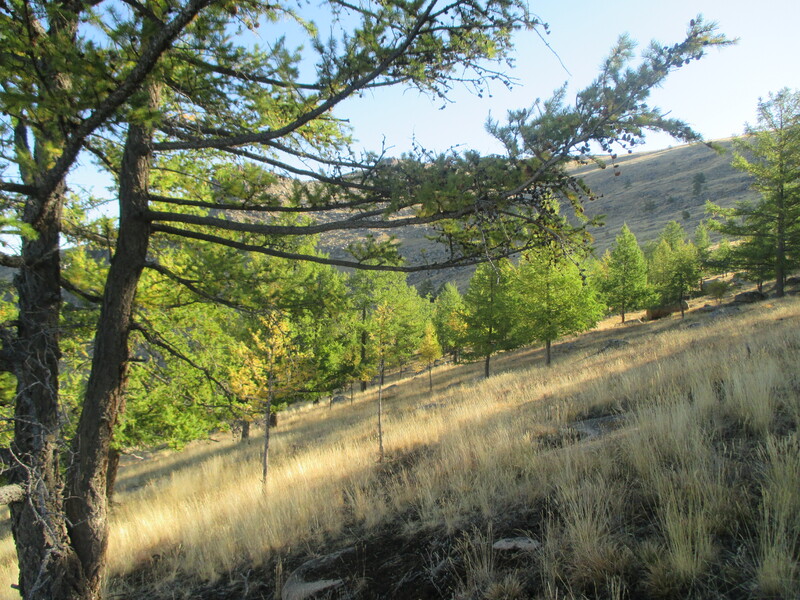 When we got to the top of that hill, we could see into the valley on the other side of the mountain, where the Bogdiin River flows into Uliastai. But we weren’t even close to done yet! 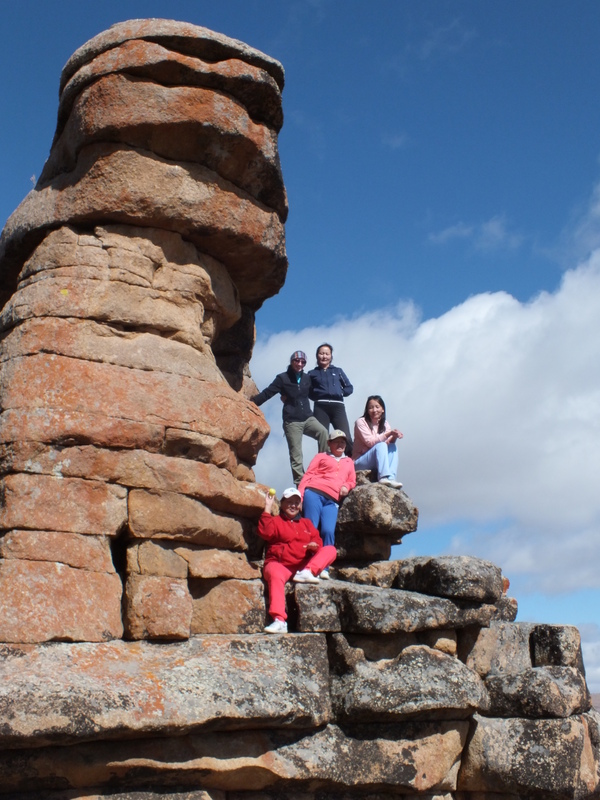 Next we had to get up to some weird rock formation! To be honest, I had absolutely no idea where we were going or if anyone else did either. I got the sense that we were just going to keep hiking up and up and up until there was no where left to hike up to. To that pointy rock formation up there a little to the left. Not only was that the top of the mountain we were on (finally! 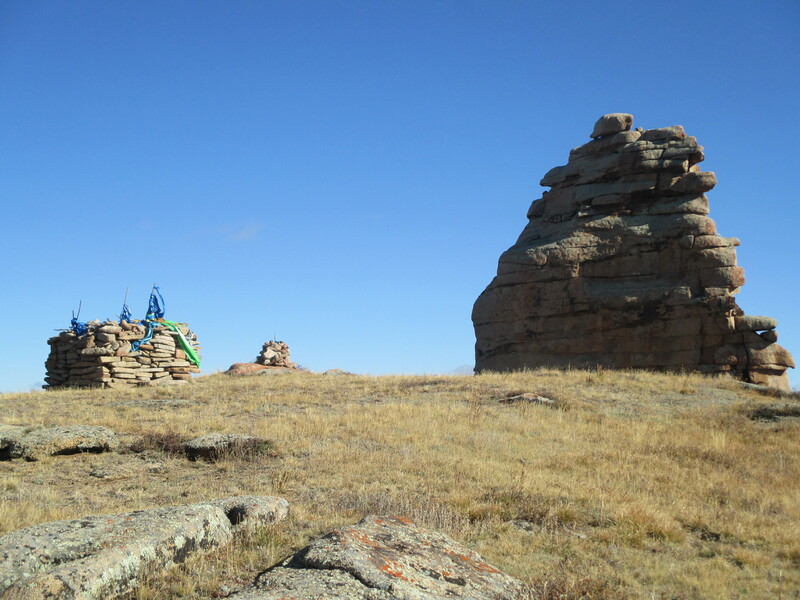 ), but there was an old legend that if that rock formation (which actually has a name: Jinst) ever fell down, the whole city of Uliastai would be flooded. Yay! 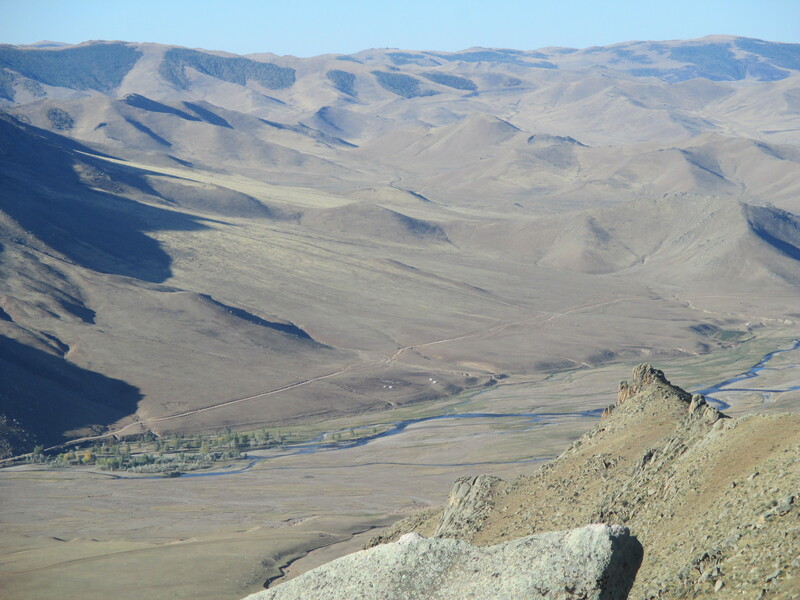 From the top of the mountain, Uliastai looked so tiny! At this point we finally sat down and had a picnic with the food we’d brought. 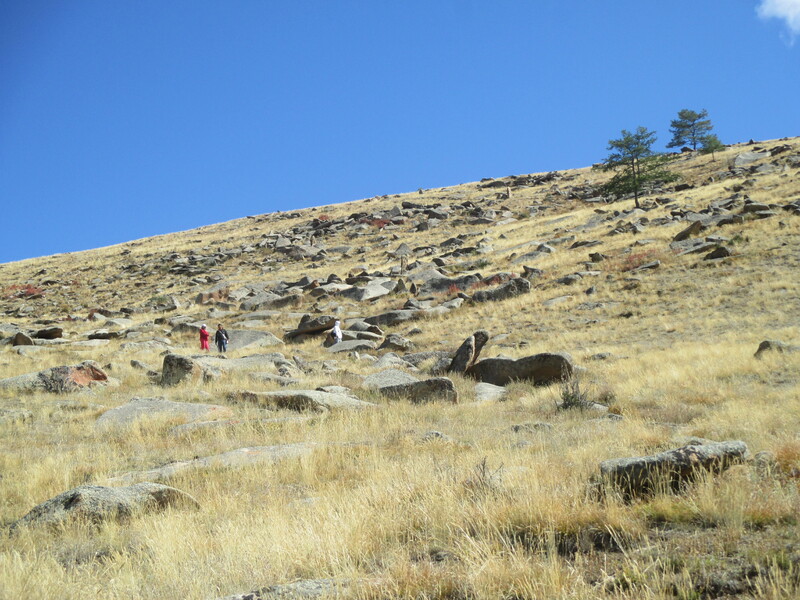 Eventually we headed back down the mountain, but instead of going down the way we had come up, we decided to go straight down one of the rockiest, steepest parts of the mountain at a ridiculously fast pace, because who couldn’t use a little damage to their knee ligaments? Come on slowpokes! It only took us 4 hours to get up there, you should be able to come back down in 20 minutes, tops! When we finally did get back down to where the cars were parked, we found that one of the other health department workers and her daughter had come to bring us more food! Time for a second picnic! While we were eating, two young boys rode by on a horse, and my coworkers (who knew that I like horses), called these random boys over and asked them if I could ride on their horse. 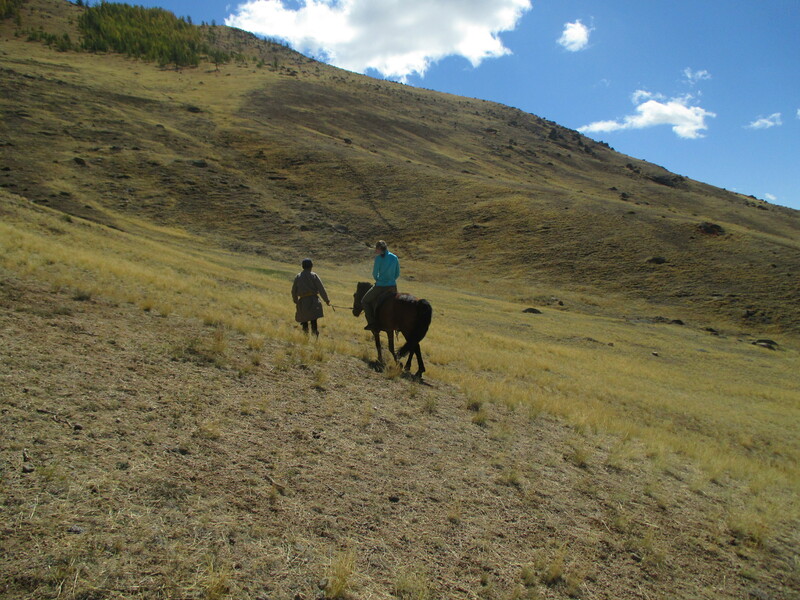 They may have bribed the boys with some of the food we were munching on, but they let me sit on their horse while one of the boys led it around for a while. But no Mongolian shindig is complete without vodka! Which our director just happened to have in the trunk of his car! Now, I’m not a fan of vodka unless it’s mixed with something into a cocktail, but we had been warned during PST that vodka would be present at pretty much all Mongolian get-togethers (even those with your boss present) and that it is customary to pass shots around. So of course I was offered a shot, which I begrudgingly took and gagged on. Finally we piled into the cars to head back to Uliastai. But then we stopped by a random ger in the middle of nowhere to ask–I kid you not–if they had any yogurt. See, traditional Mongolian yogurt can be made with the milk of any livestock, but my coworkers informed me that the best yogurt comes from the animals belonging to the herdsmen out in the countryside. So, seeing a ger in the middle of nowhere, they (correctly) assumed that a herding family must live there and have yogurt at the ready. A couple coworkers went in to ask if they had any fresh yogurt, and when they confirmed that they did, all 10 of us waltzed into this poor random family’s ger to eat their food. As my director told me, it is perfectly acceptable out in the countryside to come to some stranger’s ger and get fed. So the family served us milk tea, bread, and the coveted yogurt and chatted a while until we finally left. I was quite tired at this point (and still sick), and I thought we were going home, but when we got close to town they pulled over by the river and started dragging blankets and mats out of the cars and laying them on the ground. It was time to play cards! 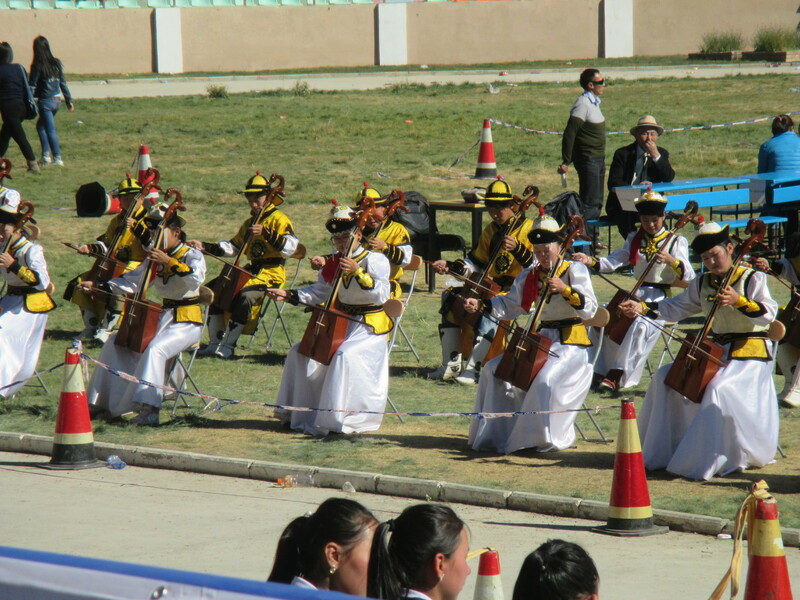 They proceeded to play a billion rounds of a Mongolian card game that they often play during lunch at the health department. They had tried to teach me how to play before, and did again on this occasion, but for some unknown reason they always assign one of the workers who speaks absolutely no English to teach me, and I’m not one of those people who can learn how to play a card game just by watching other people play it. Every time I thought I was understanding the game, someone would play a card that changed everything. 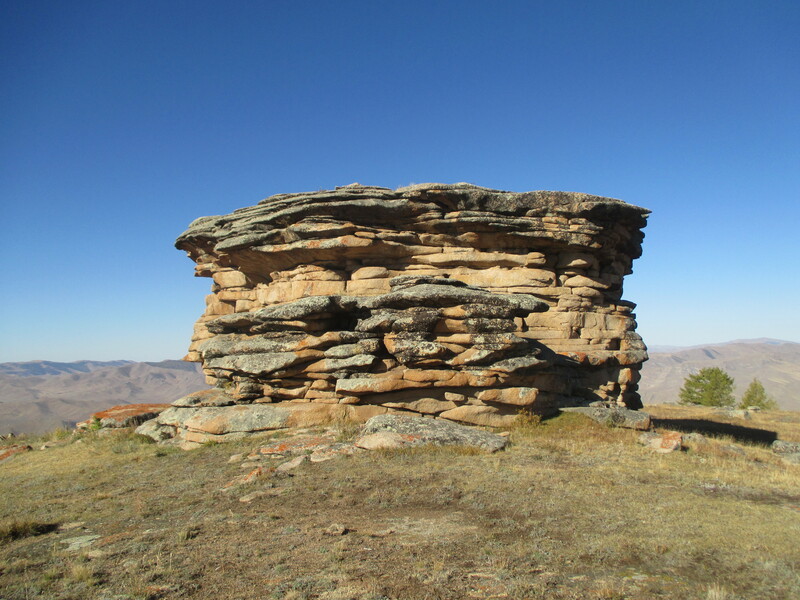 Does that itty bitty, barely perceptible rock on the top look familiar? But yeah, you probably shouldn’t spend an entire day hiking and various other exploits when you’re battling an illness, as I found out when I got much sicker the next week! 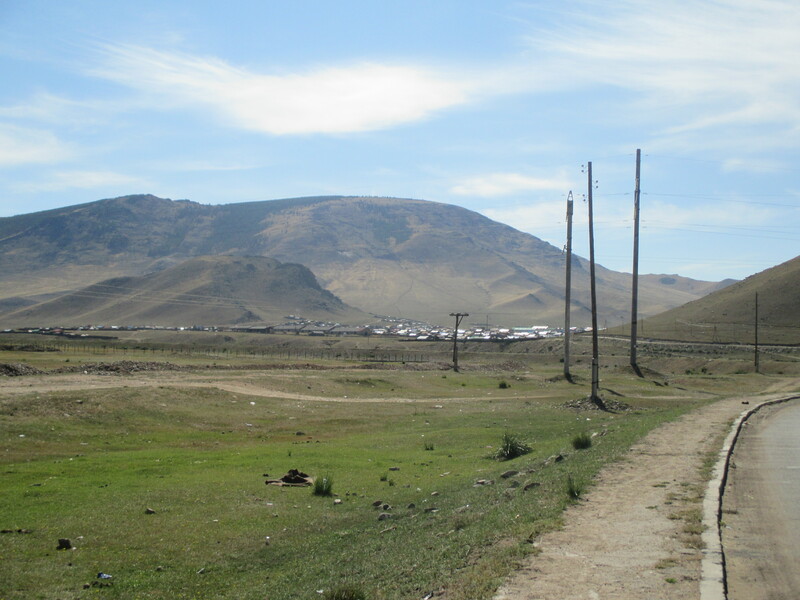 My second week in Uliastai saw the beginning of several projects. 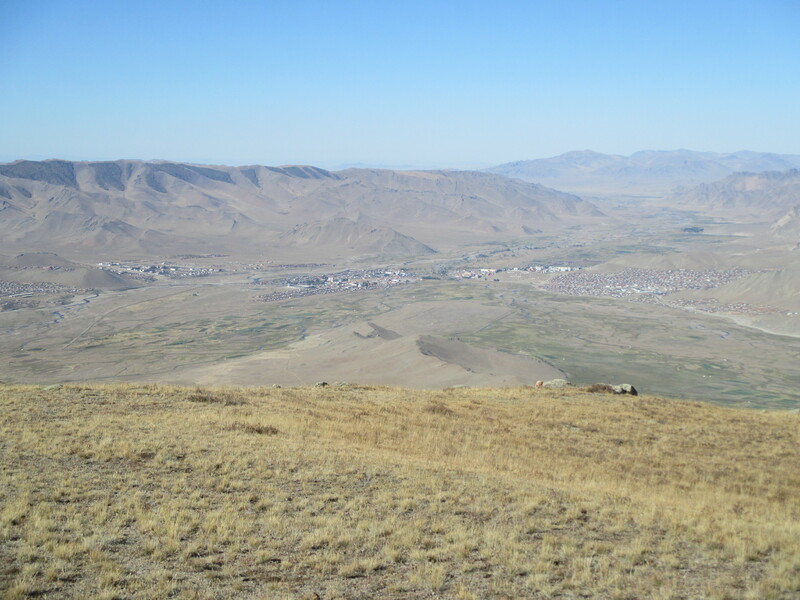 First, Dolgor, the health policy specialist at the Zavkhan governor’s office, contacted me about a dental hygiene project that she had worked on last year with some PCVs. The Volunteer who did a lot of the work with her had just recently finished her service and had left, so when she heard that new PCVs (including a Health Volunteer!) were coming, she wanted to ask for assistance in implementing the program again. 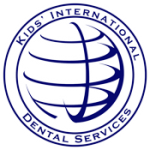 This past spring, an amazing NGO called Kids’ International Dental Services sent American dentists to Uliastai to clean children’s teeth and perform any needed dental procedures, absolutely free of charge, and Dolgor wanted to bring them back again next spring. 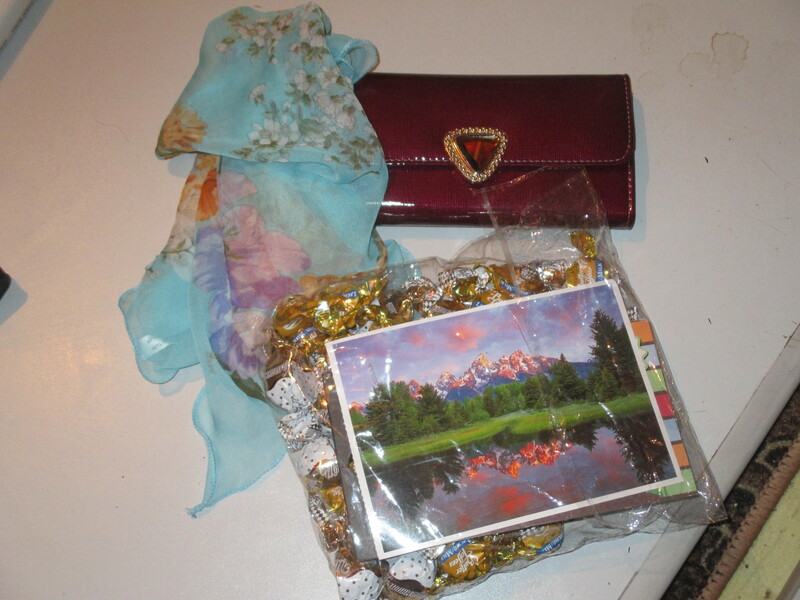 But, being based in the US, the organization didn’t have anyone who spoke Mongolian, so she needed me to help her translate the proposal and other communications with them. That week, I also started—or, more accurately, I was told I would start—an aerobics class for the staff at the health department. That Monday during lunch, one of the employees told me there would be a dance class in the health department’s gym at 4pm that afternoon. When I asked for more details, she proceeded to tell me that I would be teaching the dance class. Well, that was news to me. I told everyone that I would need more than a couple hours to prepare to teach a fitness class, so they helpfully moved it to the next week. So that next Monday morning I held our first aerobics class. I may have stolen most of the moves from a Hip Hop Abs video I had gotten on my external hard drive during one of our PC media swaps, but whatever. I am not an aerobics instructor and have never taught group fitness classes before, so I need a little bit of help. Because our gym isn’t big enough to hold everyone who wanted to participate in the aerobics classes, they decided to split it into two groups. And to get maximum benefits of the workout, each group wanted to have the class three times a week, which would mean I would be teaching aerobics classes six times a week (twice a day on Monday, Wednesday, and Friday). That idea lasted for about half a week until they realized that I could not physically do that either because a) I’m just out of shape, b) I was sick with a cold, and/or c) they were working me to death and I wasn’t getting enough rest in general. And finally, I started the much anticipated English lessons at the health department. As I am not a TEFL Volunteer and only received one session during PST regarding teaching English, I felt a little unprepared to plan and teach English classes, but I guess they felt like being a native English speaker was enough of a qualification. I knew there were at least two distinct levels of English language skills among the health department staff, so I decided to do two different level classes: beginner and intermediate. I was planning to teach each class once a week, but the HD staff told me I should teach each class twice a week. So in addition to the proposed 6 aerobics classes per week, they wanted me to teach 4 English classes per week. And work from 8am to 6pm Monday through Friday. And do additional lesson planning at home. Let’s just say my third week at site pushed me over the edge. The cold I’d had for a while got worse, I was always sore from aerobics, I wasn’t getting enough sleep or “me-time,” and all of this was making me crabby. After consulting my PC Regional Manager and some of the M24s I knew, I decided to talk to my supervisor about cutting down on some of my work. I told her that as a PCV I technically wasn’t supposed to be working at my HCA more than 40 hours a week (I was working at least 50 at that point). So she said I could just do 3 aerobics classes per week and I could leave a little early on the days I came in at 8am (the health department technically opens at 9am but she wanted me to come in early to teach classes at 8). Which sounded great, except that Friday, after noticing how tired I looked, she said I could leave at 5 that day, but then proceeded to call me into a meeting at 4:45 that ended up lasting until 6 (seriously, who holds a meeting at 4:45 on a Friday?). Sunday, August 10 was the beginning of Final Center Days, our last group training before becoming official Peace Corps Volunteers (PCVs). It was very sad to pack up everything in my room and leave my host family, and it was made worse when I got really sick the night before and barely got any sleep because I had to keep getting out of bed to barf my guts out. I was still sick in the morning, so my goodbyes to my host family were quite interesting. All of us in Dereven were supposed to meet at the school with all our luggage and take meekers over to the good old Darkhan Hotel, but because the Peace Corps Medical Officer (PCMO) had told me she wanted me to lay down and get some rest as quickly as possible and not wait around for the bumpy meeker ride, my host mom just drove me over to the hotel herself (granted, it’s only like a 10-minute drive, unlike the other groups of PCTs who were coming from much farther away). So I checked into the hotel while one of the current PCVs in charge of Final Center Days recruited some big strapping guys to help my mom carry all my luggage upstairs (of course my room was on the fourth floor of a hotel whose elevator doesn’t work). Then I took a much-needed nap, missing the first day’s sessions (which I was told were absolutely riveting). I did want to go to Site Announcements though, where they would finally reveal where we would each be living and working for the next two years. It was later that afternoon, and since I was feeling a little better, the PCMO said I could go. But she didn’t want me walking all the way to the park where it was being held, so I got a ride in one of the Peace Corps cars with one of their drivers. 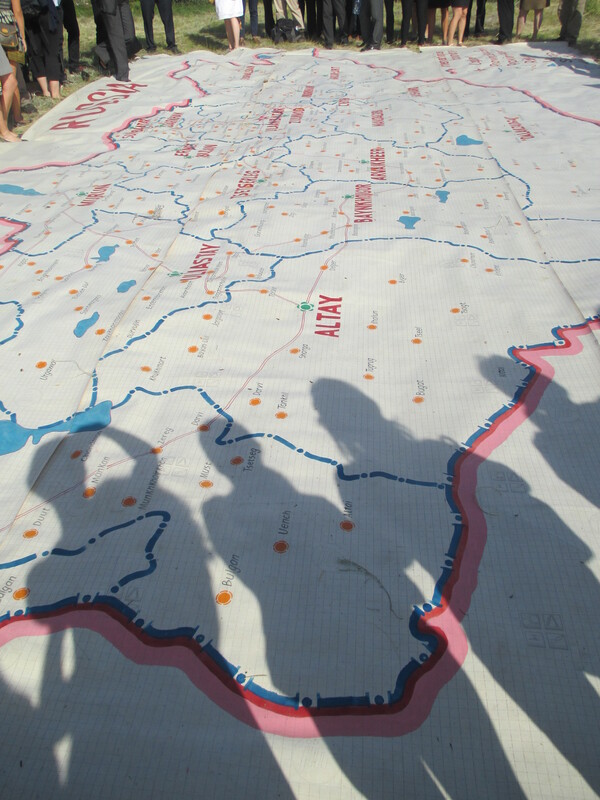 At the park, we all gathered around a giant map of Mongolia, going insane with anticipation. 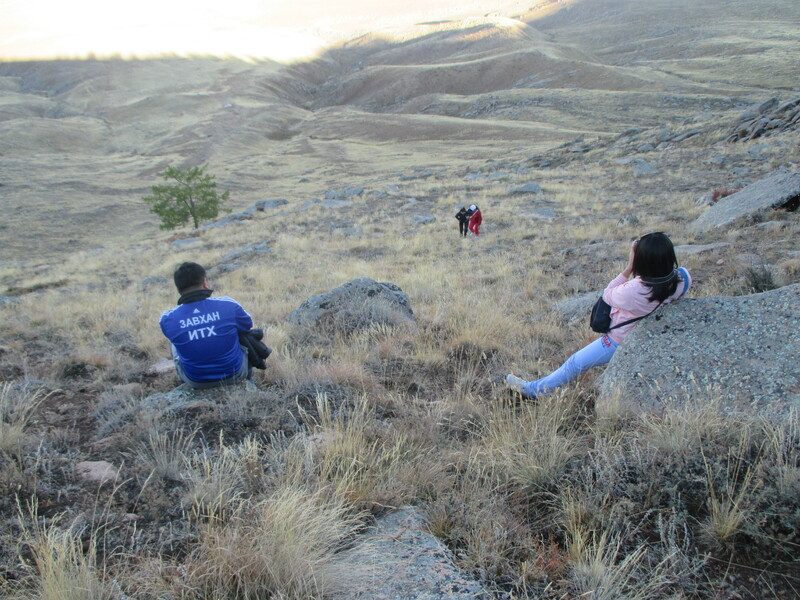 Aimag by aimag, current PCVs announced the PCTs who had been placed in the aimag center and soums. As names were announced, each person received a packet of information about their site, host country agency (HCA), and housing. 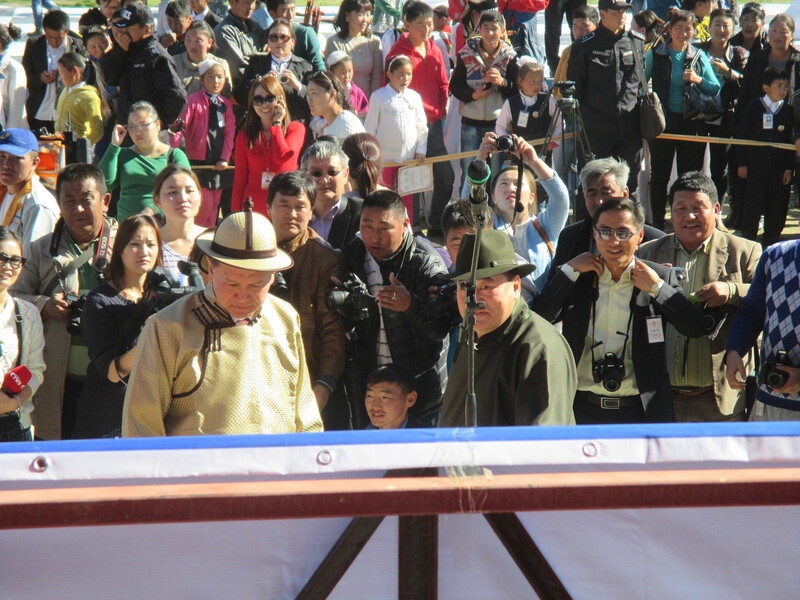 Then they went over to an even bigger “map” of Mongolia that was made out of concrete lines representing the aimag borders and statues representing each aimag center. 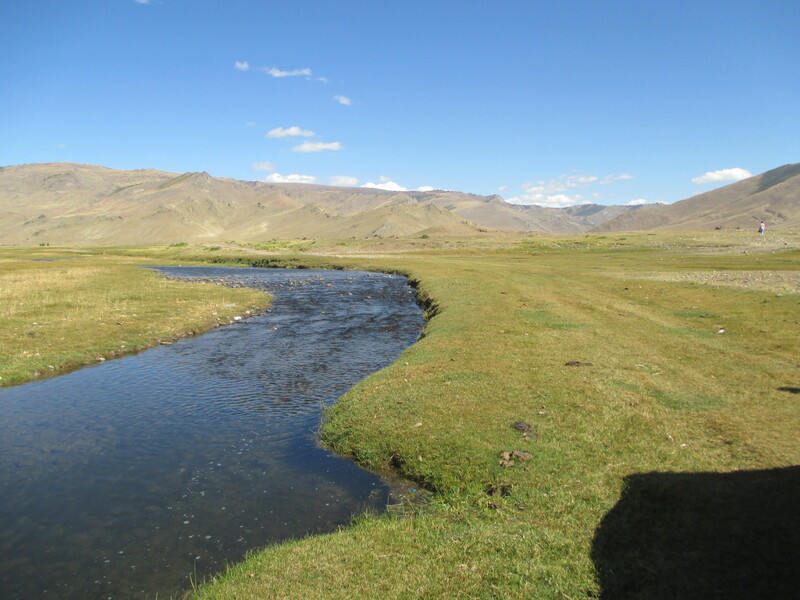 As I briefly mentioned in an earlier post, I was placed at the Health Department in Uliastai, the aimag center of Zavkhan province. I am the first Health PCV to be placed in Zavkhan, and apparently the Health Department has been hoping to have a Volunteer for a while now. 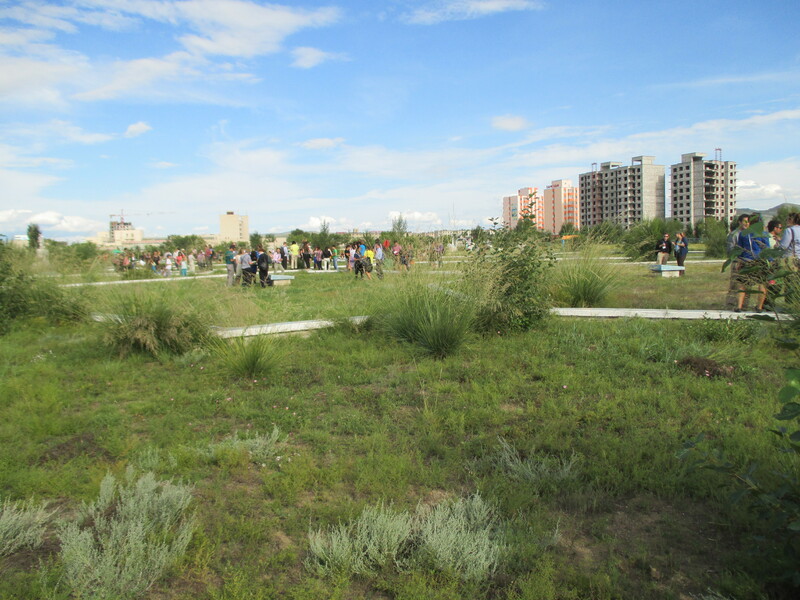 There are already three M24s in Zavkhan, two of which are also in Uliastai. In addition to myself, four other M25s were placed in Zavkhan (all TEFL Volunteers), three of which are joining me in Uliastai. I will talk more about Uliastai and Zavkhan in an upcoming post, so for now, back to Final Center Days. The next two days consisted of more sessions and trainings. But on Wednesday, we got to meet our supervisors from our HCAs (or some other representative of our HCA), who had come in for a Supervisors Conference to learn how to work with PCVs/Americans. We all gathered in the gym of a local school, and PC staff one by one announced our names and our HCA, at which point we had to go forward and meet our supervisor for the first time. The director of my health department had come, even though he is not my actual “supervisor” and I won’t be working with him directly very much. Then we had an extremely awkward hour to talk with our supervisors, but luckily my director speaks a fair amount of English. 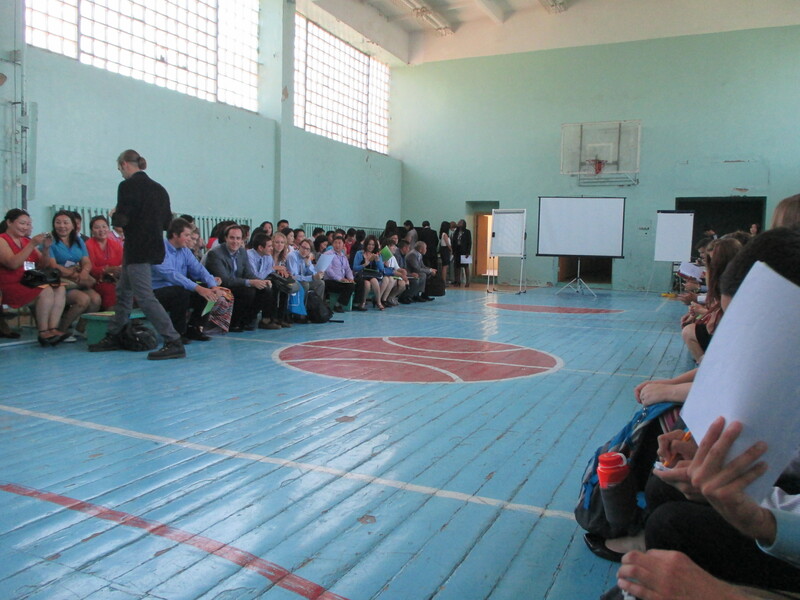 The directors of the schools where the other Zavkhan PCTs will be working also all know each other, so at least we could all awkwardly stand in a circle together. 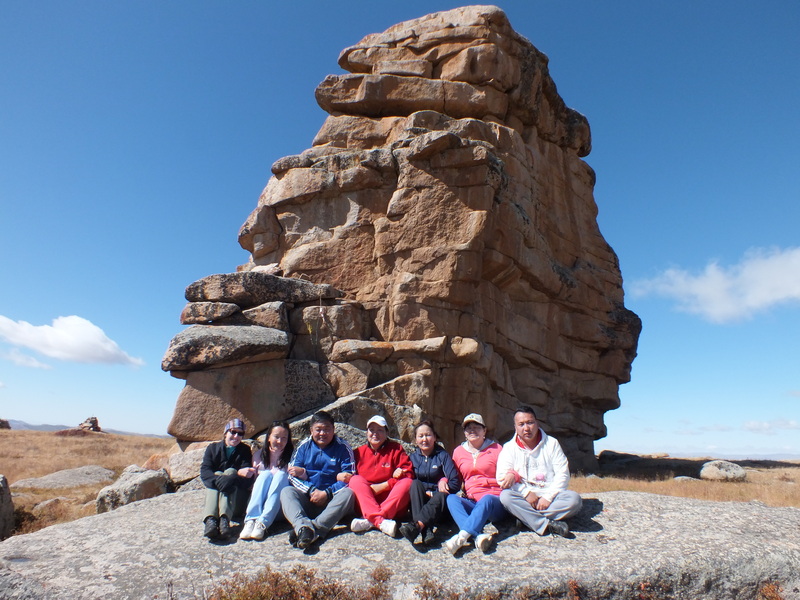 For the rest of that day and the next day, we had some sessions with our supervisors and had to eat lunch with them at the Darkhan Hotel. Then on Friday, all of us PCTs, our supervisors, and PC staff got onto buses to head to Ulaanbaatar for the Swearing-In Ceremony (to be discussed in the next post).